Panama City, Panama is a huge and thriving metropolis. I could live in the city for a year or more and still not see everything. Of course, with this trip, there was no way I was going to see everything the place has to offer. However, I am confident that I will return to Panama City one day in the future, so I am not too concerned about seeing everything at once. That will happen when it happens. Instead, my main goal for the day was to explore Casco Viejo, which is the old part of Panama City. This is where most of the historic sites are located, and it also where I decided to base myself for the length of my stay. For my first full day, I decided to spend the day checking out the area, so the day started early with breakfast at the hotel. Unlike at other hotels where a buffet is more common, this hotel had made-to-order breakfast. The choices were relatively simple, so I went with eggs and pancakes. Now, for anyone who knows me, I am not a particular fan of eggs. In fact, I often gag when I have them, but when I travel, I tend to eat things I usually would not since it is important to have a balanced diet to ward off illness and keep good health while traveling. Therefore, I added copious amounts of pepper and forced the eggs down. Much to my surprise, the pepper did a pretty good job of covering the taste. After breakfast, I continued to study the map of the old city in my room that the clerk at the check-in desk had given me the previous day to figure out a plan of action since it was still too early to be out. At around 9:30am, I headed out and followed the path I had originally taken when I was getting my bearings the previous night. Right by the hotel just across the street is a little plaza with a view looking toward downtown. Naturally, that was my first stop, and it was here that I realized how humid it truly was. My camera lens was completely fogged up, so I had to very carefully and gently wipe away the condensation using a cloth I typically carry with me. Thankfully, the humidity did not fog up the lens the entire time. Because it was Monday, as is common throughout the world, the main museums that I wanted to see, the Panama Canal Museum and Museo de Historia were both closed even though Google said the Panama Canal Museum would be open. While those places were closed, along with the Metropolitan Cathedral due to major renovation work, there were still many things to see and check out. One of my favorite activities is to visit historic churches. I'm not religious or much of a believer for that matter, but I've always believed one should visit old churches when traveling since they are often artistic treasures in themselves and often hold fascinating items inside that one cannot find in a museum. In addition, for the budget traveler, churches for the most part are completely free to enter although there are some exceptions; mainly in the Prague, so many times, a person is treated to a visual feast for the eyes for absolutely zero cost. You cannot beat that. 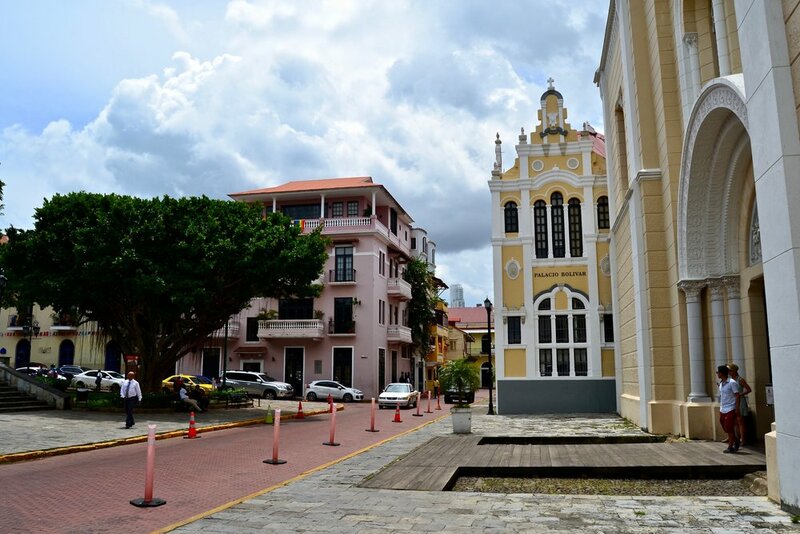 Casco Viejo holds several old colonial churches that are definitely worth going into. For me, my personal favorite was the Church of San Jose, which dates from the late seventeenth century. It is a famous site for its "Altar de Oro" (altar of gold). The high altar is actually made of wood, but it is meant to look like gold. The whole thing is ornately carved, and it actually reminded me very much of the altars in the Metropolitan Cathedral in Mexico City. 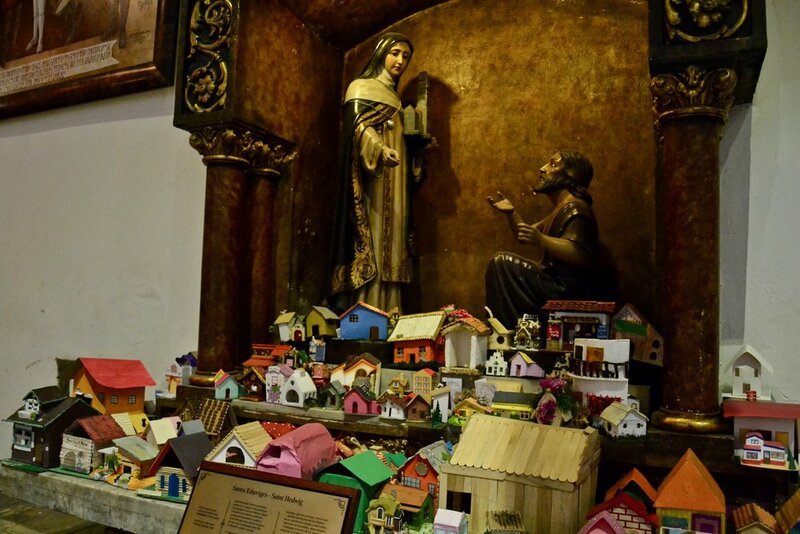 In addition, the church also holds a large-scale nativity scene that reminds me of a Neapolitan creche that one would find in the churches of Naples, Italy around Christmas. Of course, there is more to see in Casco Viejo than just old churches, the atmosphere of the place is also something wonderful to take in. Admittedly, if someone were to visit now, one would see a lot of renovation work going on since a lot of the crumbling buildings are under scaffolding. However, it is clear that the government is making an effort to revitalize the area and make it more tourist-friendly. As I walked around the area, it was not unusual to see renovated buildings which held cafes, hotels, and restaurants right next to rundown or abandoned buildings. 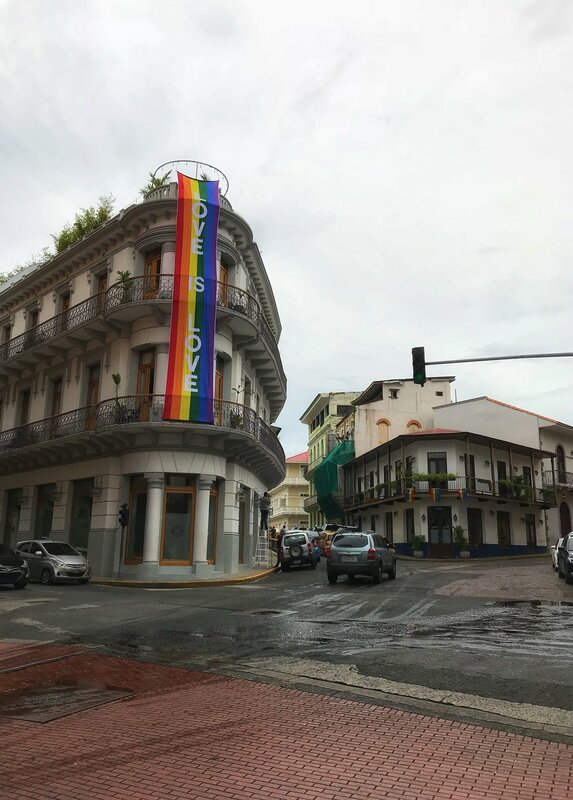 Since the old town is home to many government buildings and the Presidential Palace of Panama, there is a heavy police presence in the area, so it is a very safe area to walk around, and I never at anytime felt unsafe. In addition, there is also a tourist police headquarters right across from the government building, which was about 100 steps from my hotel. For me, one of my favorite places to walk was around the Plaza de Francia, which holds a monument to the failed French effort to build the Panama Canal. 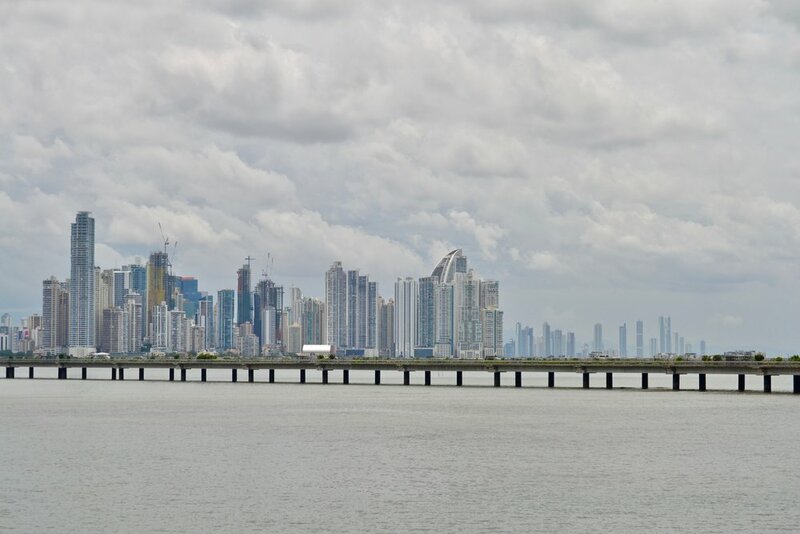 The area leads to a walkway where many souvenir sellers are located and which provides a beautiful view of the modern skyscapers of Panama City in the distance. It is definitely an ideal place to hang out, get some great photos, and take it easy. While everything generally went smoothly, there was a moment during my exploration where I ended up in a not-so-good part of town. 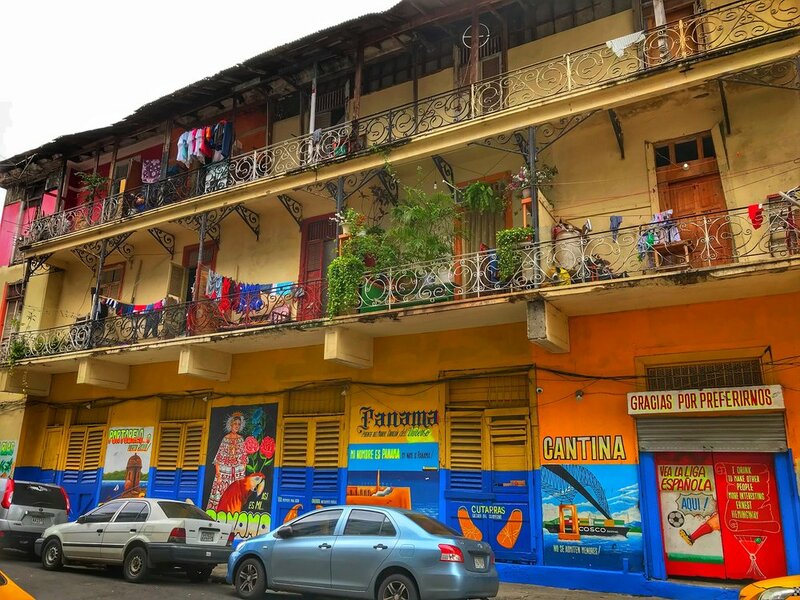 This became apparent when the rundown yet charming look of Casco Viejo turned into a generally rundown area with a definite police absence. It soon became clear to me that I was in a different area and needed to get out. Therefore, I doubled back but took a turn that I thought would lead me back to the old town. It did not and for a little bit, I seriously thought I was lost and began considering tracking down a taxi since the area was not getting better. However, it did not come to that, and I was able to backtrack to Casco Viejo successfully. Apparently, I had taken the wrong road from the one I was supposed to take, but everything was good, and I was quickly back in a safer area. As evening fell, I had not eaten since breakfast, so I was famished. Since it was Monday, there were not many places open, so at the first place I found in the plaza featuring a large sculpture of Simon Bolivar and the Church of St. Francis of Assisi, I pulled up a chair outside, and had dinner there. The dinner of pork chops served with rice and salad along with a bottle of Balboa beer was excellent. By that time, it was still humid but not oppressively so. In addition, to the nice and relatively quiet ambience of the location, a musician came up to the table next to me and started singing "Guantanamera" for the family sitting next to me. After dinner, I headed back to the hotel and took it easy the rest of the evening since I needed to be up really early the next morning for a journey through the Panama Canal. Please enjoy the photo gallery. All photos were taken by me using an iPhone and DSLR.